While our annual report finds that there is some progress, a lack of gender parity persists. Just 56 percent of startups have at least one woman in an executive position, and only 40 percent have at least one woman on the board of directors. We surveyed tech and healthcare executives and founders in the US, the UK, China and Canada. 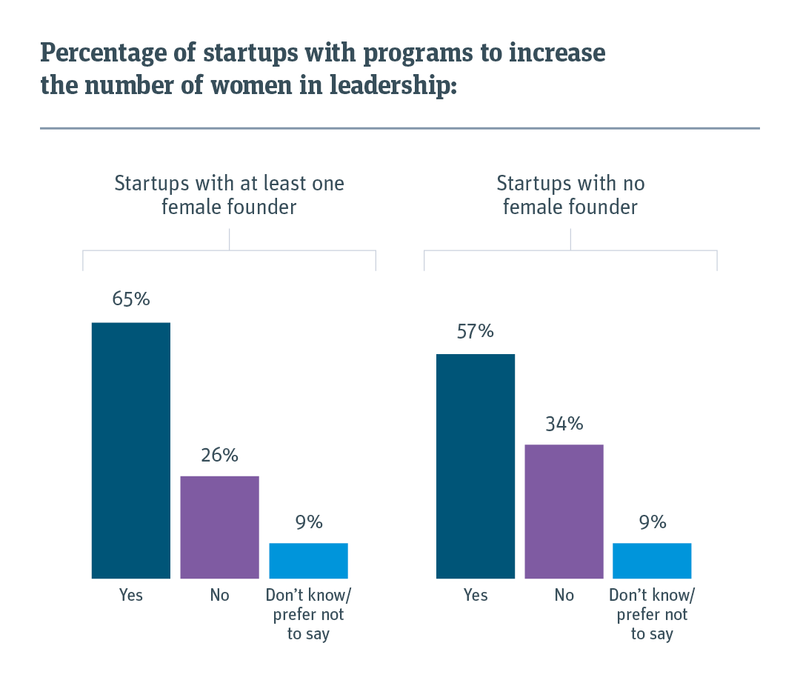 We also find that 59 percent of startups have some type of program in place designed to increase the number of women in leadership — and that the founding team’s gender often determines which executive roles women hold at startups. Since 2014, Silicon Valley Bank has produced the Women in Technology Leadership report as part of our annual Startup Outlook series of reports. Read the 2019 Startup Outlook Reports to learn more about US, UK, China and Canadian startups’ views on business conditions, hiring, raising money and more. We surveyed tech and healthcare founders and executives primarily in the US, the UK, China and Canada. The combined results show that a lack of gender parity persists: Just 56 percent of startups have at least one woman in an executive position, and only 40 percent have at least one woman on the board of directors. 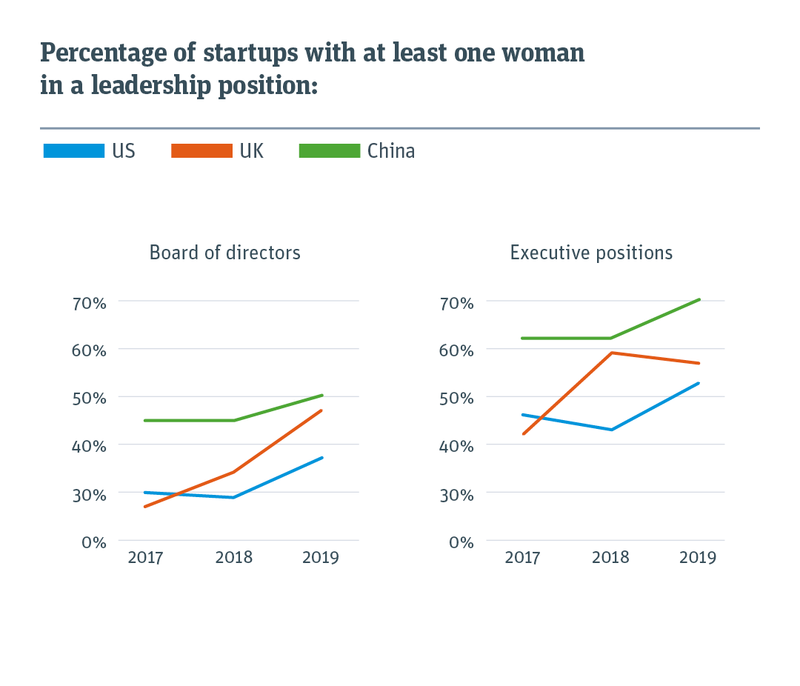 Like previous Startup Outlook Report findings, of the countries surveyed, China has the highest percentage of companies with at least one woman in an executive role. Amid a growing focus on the lack of women in tech leadership, there is some evidence that more women are joining startup boards and filling executive roles. Progress is slow, but it is encouraging to measure momentum compared with the previous two years. This is the first year that we’ve interviewed Canadian startups. 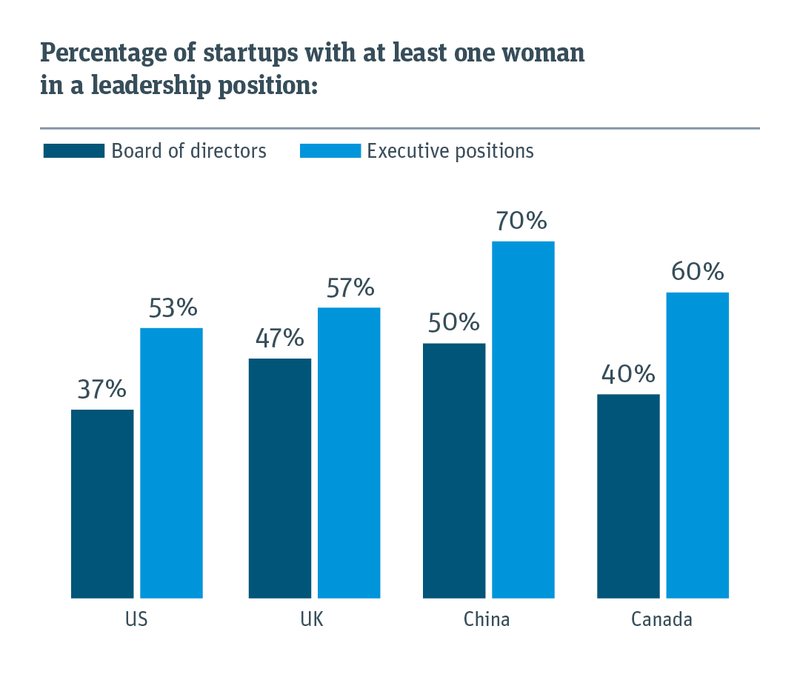 The 2019 survey found that 40 percent of Canadian startups have at least one woman on the board of directors and 60 percent have at least one woman in an executive position. Twenty-eight percent of tech and healthcare startups have at least one woman on the founding team. 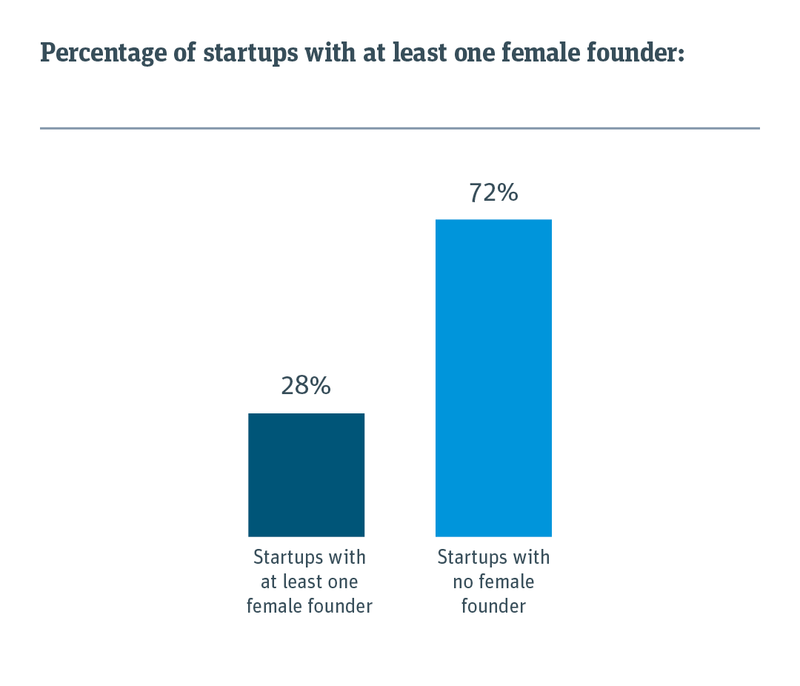 Startups with at least one woman on the founding team are much more likely to have a female CEO (often founders serve as CEOs) or COO. 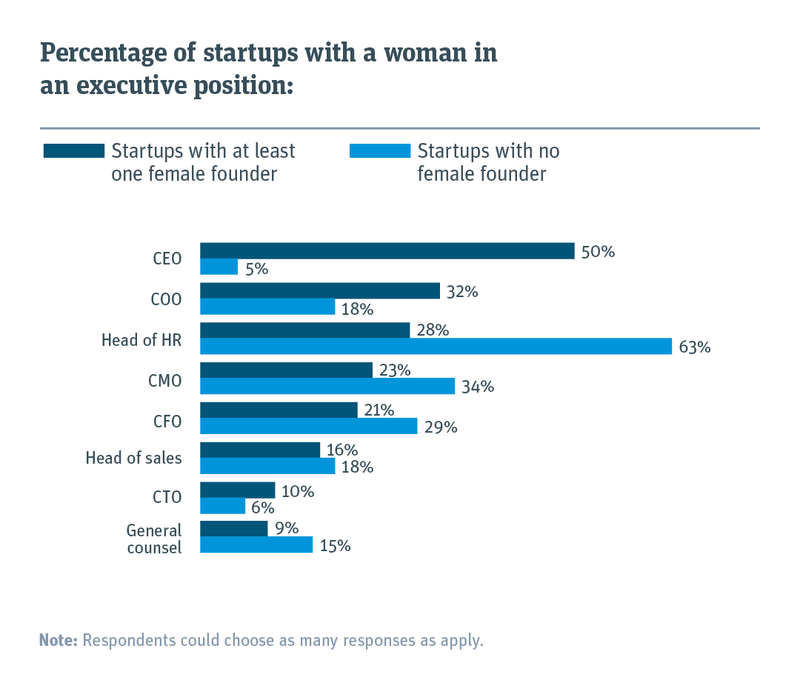 If the startup has only male founders, a woman is much more likely to be head of HR or chief marketing officer. The numbers are stark: Just 5 percent of startups with only men on the founding team have a female CEO, whereas 63 percent have women as HR chiefs. Overall, 59 percent of startups have some type of program in place designed to increase the number of women in leadership positions. There is a small difference depending on the gender makeup of the founding team: If the team included a woman, 65 percent of startups have a program compared with 57 percent if the founding team was men only. 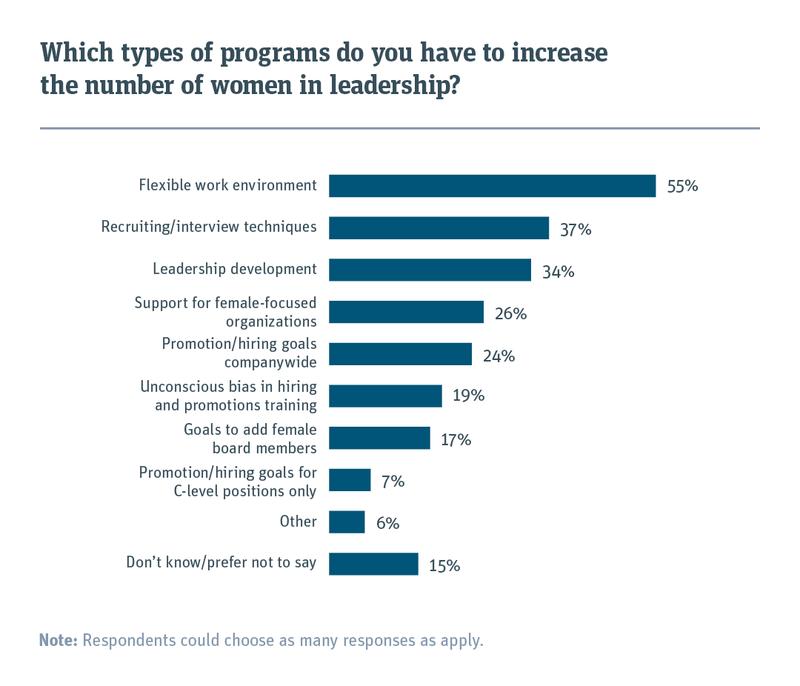 Of startups with programs in place to support gender diversity, the most common programs are a flexible work environment, recruiting/interview techniques and leadership development. Startups with promotion/hiring goals typically apply them companywide — just 7 percent have goals for C-level positions only. Finding startup capital is typically hard. Startups with at least one woman on the founding team say the current fundraising environment is even more challenging than for those with an all-male founding team. Twenty-two percent of startups with at least one female founder plan to raise their next source of funding from small investors compared with 14 percent of startups with all-male founding teams. When it comes to hiring skilled workers, the gender of the founding team plays no role: It is challenging for everybody. The skills that are most in demand among all startups are product development, technical and sales.